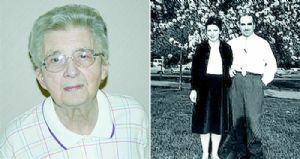 GRANTSVILLE — The harrowing story of the late Alina Jodlowski, who survived a prisoner of war camp in Poland, hasn’t been shared publicly until now. Alina, who died in August, was adamant that her story wasn’t heard until after her death. She and her late husband Stefan, who died in 2003, were members of the Polish Home Army (Armia Krajowa). In 2007, historian Joe Weaver conducted an hour and half long interview with Alina at the Goodwill Retirement Community in Grantsville. “After the interview Alina called me and said make sure this interview ‘doesn’t see the light of day until I’m dead’,” said Weaver, who is a founder of the Allegany County Museum and a former history professor at Allegany College of Maryland. Alina was most likely afraid that the secret police would come after her or her family, said John Jastrzembski, a longtime friend of the Jodlowskis and a former Grantsville resident. Alina lived in fear of the Gestapo (Nazi secret police) from the 1930s to the 1950s. “The most compelling aspect of their story is the fact they were both arrested and sent to either concentration camps, were prisoners of war or were held by secret police and they were able to escape or overcome each of those situations,” said Jastrzembski. Alina recalled the horrid conditions for the 400 women that were prisoners of war. The women slept two to a bed and the food was horrible. Alina indicated that they would have starved if it weren’t for Red Cross parcels. Her husband was arrested and escaped twice from the Russian authorities and had to leave Poland in disguise because they continued to look for him, according to Alina. Alina had a picture of Stefan before and after his arrest. “He was not the same man with all that they did to him,” said Alina in the interview. The Polish Home Army was the dominant Polish resistance movement in World War II German-occupied Poland. Alina was assigned to keeping up the morale of the Polish Home Army and Stefan, who was an officer, was instrumental in organizing as well as commissioning the Polish underground forces. Stefan, who was a captain, major then colonel, received the highest military order for bravery for moving radio equipment from a house that was threatened to another place, according to Alina. The Polish Home Army also protected the Jewish people, according to Alina. “There was a death penalty for saving a Jew,” said Alina in the interview. The Polish Home Army fought several full-scale battles against the Germans, particularly in 1943 and 1944 during Operation Tempest, the largest being the Warsaw uprising. The uprising, an attempt to liberate Warsaw, started on Aug. 1, 1944. “I left Poland in 1944 with thousands of men, women and teens after our Polish uprising in Warsaw against the Nazis. We went by cattle trains to go to the prisoner of war camp,” said Alina in the interview. Stefan was wounded nine times and his brother was wounded more than 20 times while fighting for the army, according to Jastrzembski. The Polish Home Army was disbanded on Jan. 20, 1945, when Polish territory had been mostly cleared of German forces by the advancing Soviet Red Army. Alina’s story has been documented on CD and was taken to the Polish Home Army museum in Krakow Poland by Teresa Wilmes, coordinator of library services at Allegany College of Maryland. Wilmes, a native of Poland, was returning to Krakow to visit family and agreed to take the CD to the museum. For Weaver, the most compelling aspect of his interview was Alina herself. Alina recalled all the things that were strictly forbidden during the German occupation of Poland. “Just imagine that your present world completely disappears, you cannot study because it is forbidden, your cars are taken away from you, the offices do not exist, it is dangerous to meet in the street in groups ... and your home is liable to be inspected 24 hours a day,” said Alina in the interview. Both Stefan and Alina had an ultimate respect for educators, farmers and teachers because of their history in Poland, according to Jastrzembski. He said the Nazis would kill educators and farmers if they were caught teaching or growing food. “The teachers memorized information the night before and taught it to students, whose real names they didn’t know,” said Jastrzembski. The teachers didn’t learn the real names of the students because if they were captured the students could be identified and killed, according to Jastrzembski. Alina recalled the end of her stint in a POW camp and the end of the war in 1945. In the interview, she said members of the United States Army de-liced and washed them, gave them clothes and asked them where they wanted to go. “I did not want to go (to) Poland, Russian communist occupied Poland,” she said. The Russians remained in Poland until 1989, according to Alina. She went to Italy to join Polish forces and met Stefan at a POW camp there. Alina then met?Stefan again at a dentist office in Britain about 1950, according to Jastrzembski. “I married him in 1954 in London,” said Alina in the interview. After they married Stefan wanted to go to the United States for a better job opportunity and at the time Alina was a medical social worker. Stefan went to the United States first and Alina followed. They settled in Pittsburgh. At the age of 50, Stefan returned to school and later became a professor emeritus of sociology at Saint Vincent College in Latrobe, Pa., according to Jastrzembski. The Jodlowskis had a summer home at Deep Creek Lake and ended up retiring in Grantsville. Jastrzembski met the Jodlowskis 12 years ago at a church in Grantsville and he quickly bonded with Stefan over their shared love of education and shared Polish roots. “We were both professors and we were both very mathematical and scientific,” said Jastrzembski, who is currently the division chair of science and forestry at Allegany College of Maryland. Jastrzembski noted that Alina and Stefan’s best attributes were their strong sense of convictions and their critical thinking skills. “What was right was right and wrong was wrong. They learned not to let one political party brainwash them,” said Jastrzembski.